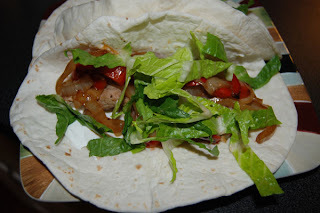 One of our favorite weeknight meals is Fajitas. They may sound like a complicated, multi-dish, restaurant treat, but if you know how to do it, they can be an easy one-pan meal that's ready in less than 30 minutes. 1) If using chicken, pound it with the smooth side of a meat mallot to 1/2-inch thickness or less. If using beef or fish, slice or butterfly to 1/2-3/4 inches thick. 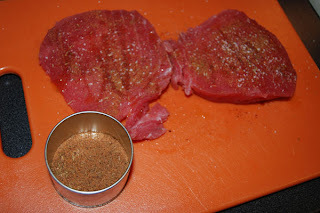 Season both sides with olive oil, salt and pepper, or salt and a packaged spice rub such as Cajun or grilling spice. Allow to sit 5-10 minutes while you slice the veggies. 2) Slice onions into 1/2-inch slices. Remove stem and seeds from the peppers and slice no more than 1/2-inch thick. 3) Heat a heavy-bottom pan (cast iron works great) on high. Sear meat quickly on one side and turn. Sear 1 minute and turn heat down to finish cooking the meat. Remove the meat from the pan when cooked through and place aside to rest. 4) Add two more tablespoons of olive oil to the pan and increase the heat back to medium-high. 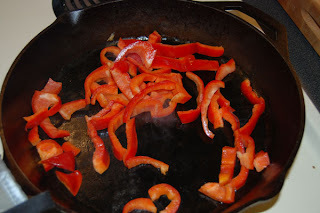 Add the sliced peppers and stir to coat with oil. Continue cooking and stirring, lowering the heat if edges begin to brown too quickly. 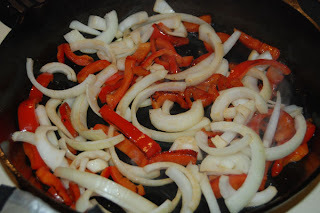 5) Once the peppers begin to soften, add the onions and a pinch of salt. 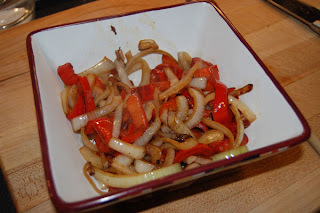 Stir and continue to cook until both the onions and peppers are almost completely soft. 6) Remove veggies from the pan and place into a serving bowl covered tightly with plastic wrap. they will stay warm and continue to steam and get softer. 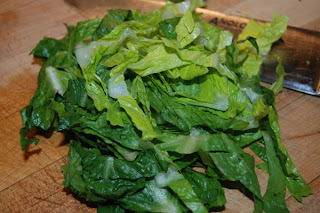 7) Slice the lettuce into ribbons and place in a serving bowl. 8) Set the sour cream and cheese out in serving bowls. If desired, heat the flour tortillas in the microwave according to package directions and set those out to serve. 9) Slice or chunk the meat and place it in a serving bowl. 10) That's it! Call the family and let each of them make their own fajita. It's that easy and it's absolutely delicious!